Crowley depiction: larger, faster and environmentally-friendly liquefied natural gas (LNG)-powered, combination container – Roll-On/Roll-Off (ConRo) ships. Commitment Class Jones-Act Ships to Offer Lower Emissions; Increased Speed, Reliability and Capacity, and Optimized Vehicle Shipping Decks. 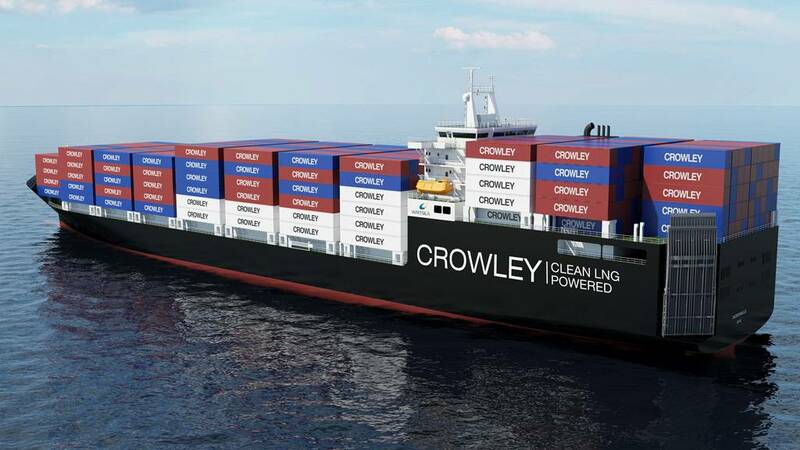 The next chapter in Crowley’s storied history of shipping and logistics services between the United States mainland and Puerto Rico will be written with larger, faster and environmentally-friendly liquefied natural gas (LNG)-powered, combination container – Roll-On/Roll-Off (ConRo) ships. El Coquí is the common name for several species of small frogs that are native to Puerto Rico, and Taíno were native Puerto Ricans who lived off the land and who had great appreciation and respect for their environment. Adopting these ship names is an acknowledgement of the subjects’ enduring importance within Puerto Rico’s diverse ecology and heritage as well as symbols of Crowley’s commitment to help protect the environment. Powered by LNG, the Crowley ships will set a new standard for environmentally responsible shipping. The vessel design has been brought to life by Warstila Ship Design in conjunction with Crowley subsidiary Jensen Maritime, a leading Seattle-based naval architecture and marine engineering firm. 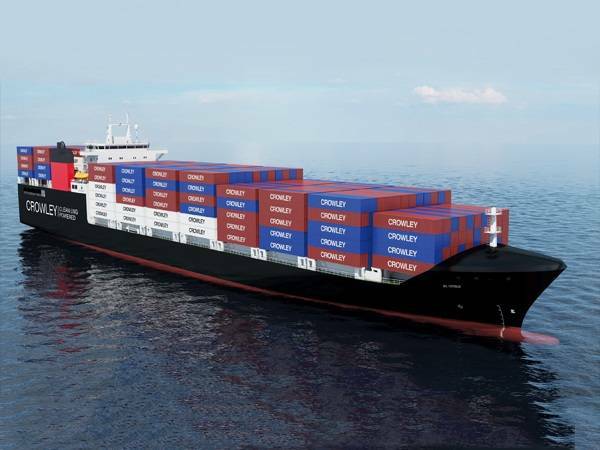 The new double-hulled ConRo ships have been designed to maximize the carriage of 102-inch-wide containers, which offer the most cubic cargo capacity in the trade. The ships will be 219.5 meters long, 32.3 meters wide (beam), have a deep draft of 10 meters, and an approximate deadweight capacity of 26,500 metric tonnes. Cargo capacity will be approximately 2,400 TEUs (20-foot-equivalent-units), with additional space for nearly 400 vehicles. The main propulsion and auxiliary engines will be fueled with LNG. Designing, building and operating LNG powered vessels is very much in line with Crowley’s overall EcoStewardship positioning and growth strategy. The company formed an LNG services group earlier this year to bring together the company’s extensive resources to provide LNG vessel design and construction management; transportation; product sales and distribution, and full-scale, project management solutions.